Resting at: Panipat Shareef, Haryana, India. His name was Sheikh Sharfuddin and Boo Ali Shah the title. His father, Sheikh Fakharuddin was a great scholar and saint of his time. The mother, Bibi Hafiza Jamal, was the daughter of Maulana Syed Nematullah Hamdani. His father came from Iraq in the year 600 Hijri and settled down in Panipat. His lineage with several links reaches to Hazrat Imam Abu Hanifa. He was born in Panipat in 606 Hijri. Studies: He completed his studies at an early age and taught near the Qutub Minar in Delhi for 20 years. He was counted among renowned scholars, and the top ranking teachers regarded him with great respect. Absorbed in Wonder: Once during the studies he was lost in absorption and wonder. He got up and threw all the books into the river and trudged into the forest and busied in prayers and meditation there. “I will not emerge myself from the river of love. If you want it, then do it.” Saying this he was lost again. He witnessed, in the state, that a saint appeared and lifted him out of the river and placed him on the bank. Several chroniclers opine that the saint was Hazrat Ali, R.A., himself. He taught him some divine secrets and disappeared. From that day he was regularly lost in spiritual wonderment. His heart was filled with heavenly light. From that day he is called ‘Boo Ali Shah’. Still some chroniclers say that he did not pledge obedience to a holy man but was admitted directly into the fold by Hazrat Ali, R.A.. Some link him to Mahboob-e Elahi, whereas others bind him to Hazrat Qutubuddin Bakhtiyar Ka’aki, R.A/. and Sheikh Shahabuuddin Suharwardy. His stay in Panipat: He lived in Panipat till his death, and served the people from there. Hundreds drew spiritual or divine benefits from him. Besides, he undertook regular teaching and propagation of Islam. Hundreds embraced Islam because of him. The Rajputs, who lived around, were the great beneficiaries. He left a deep impact on the royal dynasty of Dehli Sultanet, and preached them of good conduct. Revelation and Mysteries: One day a disciple of Shamsuddin Turk went to the city on an errand and saw Boo Ali Shah riding a lion and re-told the episode to his teacher. 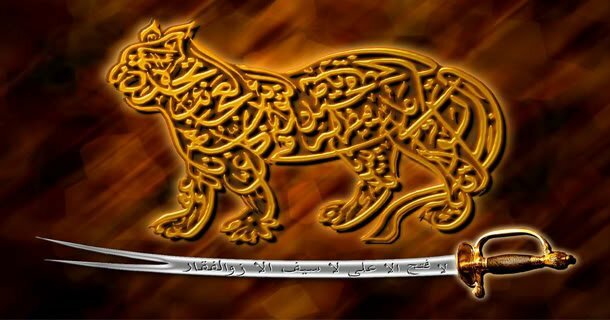 Shamsuddin Turk said to his disciple, “Go to the residence of Boo Ali Shah, and if you see him riding the lion, tell him: “The lion should live in the jungle.” The disciple obeyed, found Hazrat Boo Ali Shah in the condition and conveyed his teacher’s message. He rose from his place immediately and went to Ghote. Death: It is mentioned in ‘Sair-Ul-Akhtab’ that he died on 17, Ramzanul Mubarak 724 Hijri, at Budha Khera, but lay to rest in Panipat instead. I am Haideri (a follower of Haider, aka Ali ibn Abi Talib), I am a Qalandar and I am intoxicated (with inspiration). after, the wife of Pandit Ram Sanaihi, a pious and God-fearing Hindu. Bu-Ali-Shah Qalandar is one of the most renowed Sufi saints in history. He was born in early 1400 in Panipat, India. After the Ibadat of 36 years by standing in the water in Karnal he achieved the status of “Bu-Ali-Shah Qalandar”. The Prophet Mohammed blessed him with the fragrance Bu Ali. After achieving this Rutba, many Sufi saints came to see Bu-Ali-Shah Qalandar. After many years of devotion and service Bu-Ali-Shah Qalandar is said to have disappeared into the sky in front of all his devotees. 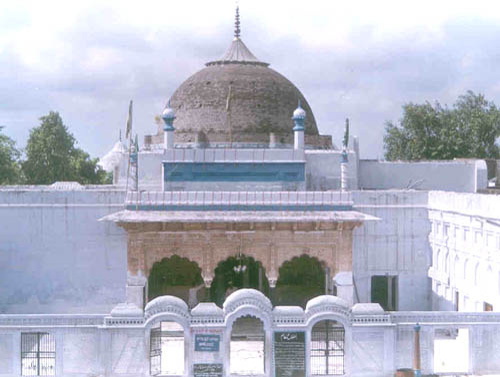 Now there is the Durbar of Bu-Ali-Shah Qalandar Sahib in Panipat, which is very well known as the Qalandari Gate. More about the saint : His name was Sheikh Sharf Uddin and Bu-Ali Shah the title. His father, Sheikh Fakhar Uddin was a great scholar and saint of his time. The mother, Bibi Hafiza Jamal, was the daughter of Maulana Syed Nemat Ullah Hamdani. His father came from Iraq in the year 600 Hijri and settled down in Panipat. His lineage with several links reached Hazrat Imam Abu Hanifa. He was born in 606 Hijri in Panipat. He completed his studies at an early age and taught near the Qutub Minar in Delhi for 20 years. He was counted among renowned scholars and top-ranking teachers regarded him with respect. Once during the studies he was lost in absorption and wonder. He got up and threw all the books into the river and trudged into the forest and busied in prayer and meditation there. He undertook severe penance and meditation, stood in a state of absorption for several days in water till the fish ate away flesh form his calves. One day he was engaged in meditation, a voice he heard. It said, “Sharf Uddin, we granted you your prayer say, what do you want?” He said, “I need none save you. I will give away my life in love while standing at this place.” The voice again descended, “Get out of water, you have to do much for us.” He replied, “I will not emerge myself from the river of love. If you want it, then do it.” Saying this he was lost again. He witnessed, in the state, that a saint appeared and lifted him out of the river and placed him on the bank. 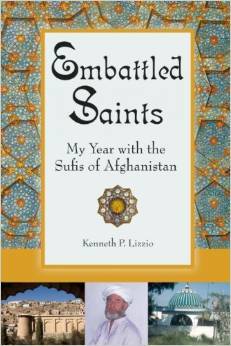 Several chroniclers opine that the saint was Hazrat Ali himself. He taught him some divine secrets and disappeared. From that day he was regularly lost in spiritual wonderment. His heart was filled with heavenly light. From that day he was call Boo-Ali Shah. Still some chroniclers say that he did not pledge obedience to a holy man but was admitted directly into the fold by Hazrat Ali. Some link him to the Mahboob-e-Ilahi whereas others bind him to Hazrat Qutub Uddin Bakhtiyar Ka’aki and Sheikh Shabu Uddin Suharawardy. He lived in Panipat till death and served the people form there. Hundreds drew spiritual or divine benefits from him. Besides, he undertook to regular teaching and propagation of Islam. Hundreds embraced Islam because of him. The Rajputs, who lived around, were the great beneficiaries. He left a deep impact on the royal dynasty of Delhi, and preached them of good conduct. One day a disciple of Shamsuddin Turk went to the city on an errand and saw Boo Ali Shah riding a lion and retold the episode to his teacher. Shamsuddin Turk said to his disciple, “Go to the residence of Boo Ali Shah and if you see him riding the lion, tell him: “The lion should live in the jungle.” The disciple obeyed, found Hazrat Boo Ali Shah in the condition and conveyed his teacher’s message. He rose from his place immediately and went to Ghote. Death- It is mentioned in ‘Sair-Ul-Akhtab’ that he died on 17, Ramazul Mubarak 724 Hijri at Budha Khera but lay to rest in Panipat instead. About Panipat : Panipat pronunciation is a historic as well as an ancient city in the Panipat District in Haryana state, India, The city has a population of 216,000. Panipat was one of the five cities (prasthas) founded by the Pandava brothers during the times of Mahabharata; its historic name being Paneprastha. Panipat was the scene of three pivotal battles in Indian history. The First battle of Panipat was fought in 1526 between Sultan Ibrahim Lodi and Zaheeruddin Babur. The fight was won by twelve thousand soldiers of Babur over one lakh soldiers of Lodhi because of cannons and better organization of force. Babur laid the foundation of Mughal Empire in India. The Second battle of Panipat was fought in 1556 between Hemu and Akbar. Hemu fell unconscious when an arrow hit his eye and his army ran away. He was beheaded by Akbar. The Third battle of Panipat was between Ahmad Shah Abdali and Marathas under Sadashivraobhau, the cousin of Peshwa Nanasaheb, who were protecting the Mughal emperor Shah Alam II. This battle marked the beginning of fall of Mughals and rise of British in India. Panipat is the city of textiles and carpets. It is also known for its world famous pickle ‘Pachranga International’. This city is also famous for its handloom industry. It is also home to many industries such as Indian Oil Co. Ltd. (IOCL) Refinery, NTPC Thermal Power Plant and National Fertilizers Limited. It is the biggest centre for cheap blankets and carpets in India. The main places of attraction are the Graves of Ibrahim Lodhi, Kabuli Bagh, Devi Mandir, Kala Amb, Salar Gunj Gate, and Tomb of Bu-Ali Shah Kalandar. ‘Kala Amb’ is a memorial built in memory of the soldiers who died in the battlefield of panipat. It is said that blood of the died soldiers was mixed with the soil and the fruit of a mango tree became black in color due to that and hence the name “Kala Amb” meaning ‘Black Mango’. Famous Urdu shayar “Maulana Haali” was also born in panipat. It is 90 km from Delhi on NH-1 and comes under the National Capital Territory, Delhi, India. These are the pics of hazrat bu ali shah kalandar’s freiend Mubarak Ali Shah. Hazrat bualishah kalandar have said that if u want to give me salami then u have first give Salami to my friend then only i will accept your salam. So we have to first go the hazrat mubarak ali shah and give salami there and then give salami to hazrat bu ali shah kalandar. Both of the hazrat’s dargah is under one tomb and next to each other.